Why is it important to service my cabin filter? Why does the filterheads.com cabin filter look darker than the one I took out of my vehicle? Is the Filterheads filter as good as an "Original" or "Genuine" filter? I am interested in buying in bulk - do you have any volume discounts? How often should I change my cabin filter? How important is the airflow direction through a cabin filter? How do I know where my cabin filter is located? How do I know if my vehicle has a cabin filter? 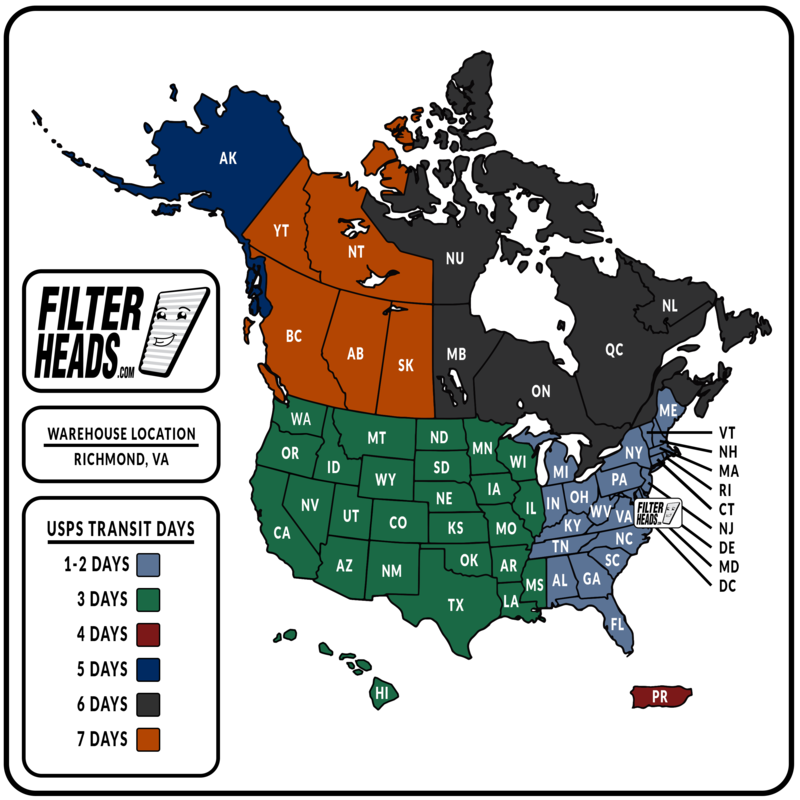 Does FilterHeads sell to Canadian customers? Does FilterHeads sell engine air filters? Can I add a cabin filter to my vehicle if my vehicle does not have one? Q: Why is it important to service my cabin filter? As the filter gets dirtier, the air flowing through your vent system could become restricted. This air restriction limits the efficiency of your air conditioning or defrost system. Extremely dirty filters can also be a source of unpleasant odor in your car. Q: Why does the filterheads.com cabin filter look darker than the one I took out of my vehicle? Some of our filters contain carbon in the media. This is the same type of carbon known as "activated charcoal" used in water filters. The carbon gives the media its darker look. Where the original equipment filter is carbon, the Filterheads.com cabin filter is made with carbon media. Carbon is included in some cabin filters is to absorb odors from the air flowing through your vehicle's vent system. Q: What is a cabin filter? It is a filter that cleans the air entering into the passenger compartment through the vehicle's vent system. It is similar to an air conditioning filter you may have in your house. It also helps keep the vehicles vent system and interior clean. Most cars manufactured in the past few years have one. Q: Is the Filterheads filter as good as an "Original" or "Genuine" filter? The filters we sell are "aftermarket" - which means they are made by a company that has no connection with the car manufacturer. The "Aftermarket" has both good and bad reputations. Some aftermarket brands are known for being better than the original parts. Other brands, unfortunately, give the aftermarket a reputation of being the cheap alternative to original parts. The parts we sell are as good as (and in some cases better than) the original parts. Each part is designed to meet or exceed the function of the original. Q: I am interested in buying in bulk - do you have any volume discounts? Most of our filters come from the factory in 3-pack cartons. If you are interested in ordering in carton multiples, we can give you a substantial discount. Contact us for a quote. Q: How often should I change my cabin filter? In general a cabin filter should be changed every 15,000 miles or once every year. The service interval can vary depending on your driving habits. In some instances the maintenance section of your owner's manual may list the recommended service interval for your vehicle. Q: How important is the airflow direction through a cabin filter? The media in these types of filters will perform exactly the same in both directions when first installed. The difference between the sides is their capacity to hold particles before the filter becomes "clogged". The way filter media is tested is by measuring how much it restricts the airflow after a specific quantity of dust (grams) has been caught. A filter that is "backwards" will reach its maximum allowable restrictiveness at a lower number of grams caught. Most filter media (including ours) is made in layers. The more open weave layers are on the "input" side, and the tighter woven layers are on the "output" side. You won't damage your car by putting it in the wrong way. The filter will simply reach its maximum allowable restrictiveness sooner. A filter at or beyond its maximum allowable restictiveness will cause the vehicle's air system to move less air than intended. The most significant consequence would be ineffective defrosting of the windshield. The directional indication on the edge of a cabin filter will be oriented so that the higher capacity side will face the dirty incoming air. Q: How do I know where my cabin filter is located? We provide you with an instruction sheet and/or a video that shows you how to change your cabin filter and where it is located in your vehicle. Your owner's manual may also contain some of this information. Generally, the filter will be located behind the glovebox, below the glovebox, under the windshield cowling or under the hood. Q: How do I know if my vehicle has a cabin filter? Start by looking up your vehicle's make, model, and year with the drop down boxes on the top of this page. If it is listed as having a cabin filter then your vehicle came with a cabin filter from the factory or was offered with a cabin filter option. A new filter can be installed in the vehicle if the cabin filter housing is present. Q: Does FilterHeads sell to Canadian customers? Yes, and shipping is also free for them. We ship to Canadian customers via USPS. All duties and Canadian taxes are the responsibility of the customer. Q: Does FilterHeads sell engine air filters? Yes, we do sell a select number of engine air filters. If we have an air filter for your engine, it will be listed on the same page with the cabin filter - in the bottom-right area of the page. Q: Can I add a cabin filter to my vehicle if my vehicle does not have one? Yes, if your specific vehicle is designed to use one. Some vehicles came from the manufacturer without an optional cabin filter installed. In these cases, you can simply insert the correct filter into the empty housing. In other cases, a vehicle may have come from the manufacturer without an optional cabin filter or housing. The housing can be ordered from a car dealer. In this case, you must install the housing before you can install the filter. Some cars did not come from the manufacturer with the option of a cabin filter. In this case, you cannot add one.